In an odd twist, Honda's Ridgeline Pickup is ranked higher than the Ford F-150 even though Ford's truck had better crash test results. Here's why Honda is a Top Safety Pick and Ford's F-150 is not. In a new round of crash testing conducted by the Insurance Institute for Highway Safety (IIHS), only one truck of the eleven tested now has a score of Good on all the crash tests the group conducts - the Ford F-150. Yet, Honda's Ridgeline pickup truck, which did not earn a score of good on a key crash test, is ranked higher overall by IIHS. To understand why we need to look more closely at how a vehicle earns a Top Safety Pick designation from IIHS. 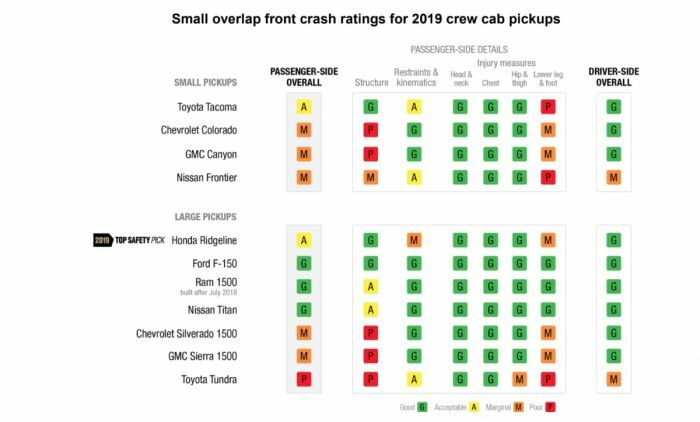 "To qualify for 2019 TOP SAFETY PICK, a vehicle must earn good ratings in the driver-side small overlap front, moderate overlap front, side, roof strength and head restraint tests, as well as an acceptable or good rating in the passenger-side small overlap front test. It also must earn an advanced or superior rating for front crash prevention and an acceptable or good headlight rating." The Honda Ridgeline earns the necessary scores for the IIHS Top Safety Pick Award. This despite a less than Good score of Acceptable on the passenger-side small frontal overlap crash test. Look closely at the full results of the Ford F-150's score and we can see that its crash results are all Good. The F-150 also scores Superior on automatic emergency braking. What bumps it off the list of contention for a Top Safety Pick award from IIHS are its headlights. All three of the headlight packages that Ford offers on its F-150 earn the lowest score of Poor. And not by a technicality. Each of the three headlights offered has less than acceptable low beam and also high beam visibility in curves. In addition, two of the three packages offered have excessive low-beam glare that blinds oncoming drivers. Furthermore, Ford does not earn any bonus points for curve-adaptive headlights because its lights are fixed in place and don't bend into corners. Safety has gone beyond just crash tests. The Ford F-150 falls down on the strength of its headlights. You can view the very detailed IIHS report on the Ford F-150's headlights here.